Sending along congratulatory notification that TEAM REV took TOP DOG honors in yesterday's YANKEE WATERFOWLERs HUNTING RETRIEVER CLUB'S 2016 ANNUAL PHEASANT CHAMPIONSHIPS. Working as a two man / one retriever team, owner / handler / gunner Rick and his son Nick also a designated gunner moved efficiently through a large cover plot hunting over REV whilst being scored by a YWHRC event official scorekeeper. REV is currently a two year old Labrador Retriever with an established reputation as a highly bird driven, stylish, and confident young retriever and is just entering his 2nd hunting season. REV has further distinguished himself in earning his HRC STARTED HUNTING RETRIEVER and AKC JUNIOR HUNTER titles with 8 for 8 qualifying scores during 2016. During said YWHRC event, retrievers are expected to quarter and hunt under control within a designated area, finding, flushing, and retrieving as many of four birds as possible during a 25 minute period. The two persons gunning are issued a total of 4 shotgun rounds each and extra points are achieved for unfired shells returned and minutes of the alloted 25 minute period not used. Rick, Nick, and REV took TOP DOG honors scoring 1st Place overall for the most points earned by any of the retrievers entered in a number of classes during the event. The father and son team also distinguished themselves taking 1st Place honors for a team utilizing a junior level gunner, Nick being 15 years old. Nick was particularly accurate whilst gunning and displayed safe firearms handling skills throughout his time afield. 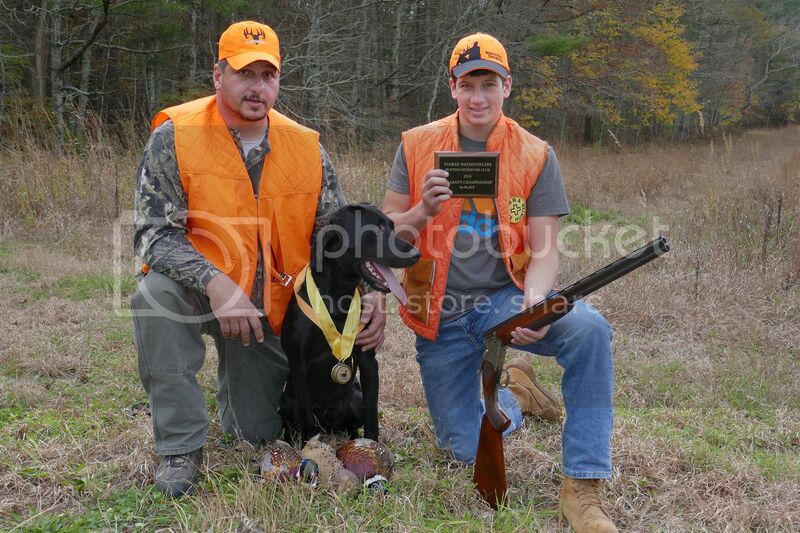 TEAM REV - Owner / Handler and Gunner - Rick, his son Gunner - Nick, and SHR CHURN CREEK'S EL DIABLO NUTMEG STATE REVOLUTION (call name "REV") - YANKEE WATERFOWLERS HUNTING RETRIEVER CLUB'S 2016 ANNUAL PHEASANT CHAMPIONSHIP'S TOP DOG. Last edited by IRISHWISTLER; 11-01-2016 at 07:11 AM. And Congratulations to trainer Irishwhistler. You should be very proud of Team REV. Strong team, strong dog, all aided by a strong trainer! Congratulations to Team Rev! Thanks much for ye kind wishes for TEAM REV. T'is always grand to see a young Lab we work with develop from a diamond in the rough to a highly polished stone. Now mind ye there is still much room for improvement and further skills development with regard to REV, but he is on very solid footing early in his journey.